Costa Calida Hotels in the Murcia area. 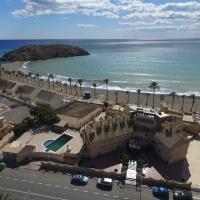 Local hotel information bookable online Our area has its own microclimate includes La Manga and the Mar Menor. Great Golfing area as well. Los Alcázares – Murcia – Costa Calida – Spain. Los Alcázares has 18 cosy accommodations. Set in a spectacular 18-hole golf course just 1 km from the Mar Menor Lagoon, this luxurious hotel has a seasonal outdoor pool with a water slides. La Manga – Murcia – Costa Calida – Spain. La Manga del Mar Menor has 115 cosy accommodations. Apartments Montemares Golf Luxury Villas & Apartments at La Manga Club . La Manga del Mar Menor is one of the most exotic areas of Spain. It’s a natural strip of land surrounded by two seas, the Mar Menor and the Mediterranean Sea. It’s a perfect place to enjoy to the fullest of the sea, above all in the spring time and the summer too, when is the high season and there are a lot of nautical sports. The area has all type of services such as bars, restaurants, supermarkets, shops, medical centers, dentists, pharmacies, golf courses, marinas, nautical sports and multiple leisure and free time options. El Puerto de Mazarrón has 21 cosy accommodations. The Playa Grande is right next to the beach and has an outdoor swimming pool. The modern rooms have a large terrace. This well-equipped hotel has a nice terrace next to the swimming pool. 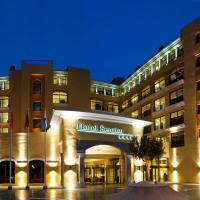 Spain Info Costa Calida Hotels.